What type of Quantum Sensor do I need? Apogee Instruments produces two types of quantum sensors original and full-spectrum quantum sensors. The Original Quantum Sensors (SQ-100, SQ-200, SQ-300, and SQ-400 Series) are black and have a spectral range of 410 to 655 nm. The Original Quantum Sensor works great for most single light, non-LED, and sun applications. The Full-spectrum Quantum Sensors (SQ-500 Series) are gold and have has a spectral range of 389 to 692 ± 5 nm. The Full-spectrum quantum sensor is the best option for LED and multiple light applications. Once sensor type is determined, you will need to decide what output is needed to determine the sensor model number. This is usually dependent on the type of controller/logger you have. Which Original Quantum Sensor do I need? Which Full-Spectrum Quantum Sensor model do I need? What is the spectral range of Apogee Quantum Sensors? What is the difference between the SQ-110 (Sunlight Calibration) and the SQ-120 (Electric light Calibration)? The SQ-110 is calibrated for sunlight. The SQ-120 is calibrated for electric light. The sun setting is 1.14 times the electric value, a 12.3 % offset, which means that the sunlight calibration reads 12.3 % higher. How is the line quantum (SQ-300 series) different from the single sensor (SQ-100, SQ-200, and SQ-400 series)? The line quantum is a sensor with multiple detectors installed into a bar rather than a single sensor installed in our domed-shaped head. The line quantum sensor was developed to measure PPFD in applications with high spatial variability, such as below a plant canopy where leaf shading is constantly changing. The mV output from the line quantum sensor is an average of all the sensors in the bar, there is no way to monitor each individual sensor, only the averaged output. Which Quantum Sensor should I purchase for my Greenhouse? You should purchase the quantum sensor that matches your greenhouse light source the closest. We recommend an electric light calibrated sensor to measure supplemental electric lighting, a sunlight calibrated sensor to measure daylight PAR, and the SQ-500 series sensor for LED lights. Spectral Errors for Popular Light Sources is a great tool to determine which Apogee sensor matches your light source the best. What Quantum Sensor should I purchase for my Aquarium? You should purchase the quantum sensor that matches your aquarium light source the closest. We recommend the MQ-210 or SQ-420 for supplemental electric lighting and sunlight. We recommend the MQ-510 or SQ-520 for LED lights. Spectral Errors for Popular Light Sources is a great tool to determine which Apogee sensor matches your light source the best. Apogee does offer meters and sensors, models (MQ-210, MQ-510, and SQ-520), that are ready out of the box for underwater measurements. These underwater meters and sensors are pre-programmed with the immersion effect correction factor, so no post-measurement corrections need to be made. All other Apogee quantum sensors and meters need to have their respective immersion effect correction factor multiplied to their reading. For more information on underwater PAR measurements click here. How can I use a voltmeter to determine readings from my SQ-100 and SQ-300 series quantum sensors? The SQ-100 and SQ-300 series are considered to be self-powered and have been calibrated to 5.0 µmol m-2 s-1 per mV. Use a voltmeter with a mV setting to attain better resolution. Connect the positive lead of the voltmeter to the red wire of the SQ and the negative lead of the voltmeter to the black wire of the SQ. Once you are reading the mV output from the sensor, simply multiply this reading by 5.0. This will give you the µmol m-2 s-1 output from the sensor, also known as Photosynthetic Photon Flux Density (PPFD) or Photosynthetically Active Radiation (PAR). How should my quantum sensor be mounted? Mount the sensor to a solid surface using the nylon mounting screw provided. To accurately measure PPFD incident on a horizontal surface, the sensor must be level. An Apogee AL-100 Leveling Plate is recommended for this purpose. To facilitate mounting on a cross arm, an Apogee AM-110 Mounting Bracket is recommended. Are Apogee Quantum Meters waterproof? The handheld meter is not waterproof, only the sensor and cable are waterproof. If the meter might get wet from splashing we recommend placing it in a plastic bag or container to help protect it from accidentally getting wet. If Apogee quantum sensors are used underwater, please refer to Underwater PAR Measurements. The AC-100 communication cable accessory is used to download saved measurements from any of our handheld meters. This USB cable includes a built-in circuit board to convert voltage levels to be compatible with the meter. Normal USB to mini-USB cables will not work; you must use the AC-100 communication cable. The AC-100 also comes with a flash drive that includes the necessary computer software, drivers, and instructions. 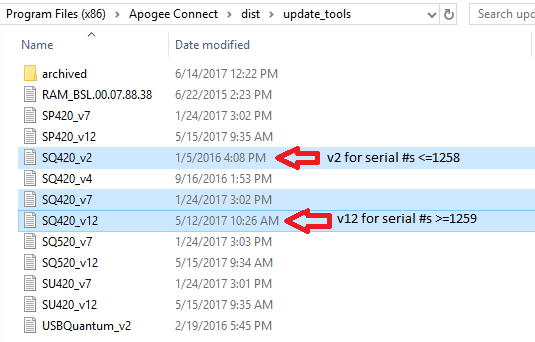 If you already have the AC-100 and just need the software files please click here. 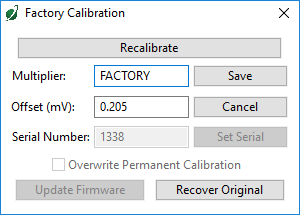 Do I need to apply an immersion effect correction factor to my meter/sensor measurements? The MQ-210 and MQ-510 meters are designed for underwater PAR measurements, and already apply the the sensor's immersion effect correction factors to the meter readings through firmware so no correction needs to be made for underwater measurements. 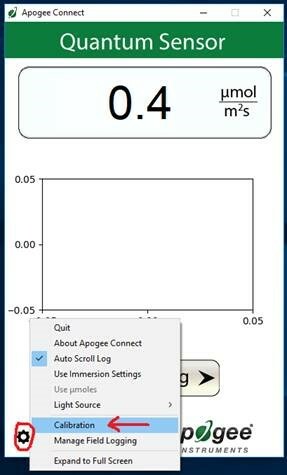 The SQ-420 and SQ-520 have an "Immersion Setting" that applies the immersion setting to the sensor's readings through the ApogeeConnect Software. When the immersion setting is selected there is no need to correct for underwater measurements. All other Apogee meters and sensors need to have their measurements multiplied by their respective immersion effect correction factor when used to take underwater measurements. Original quantum sensor models should have their measurements multiplied by 1.08 and full-spectrum models should have their measurements multiplied by 1.32. Additional information on underwater measurements can be found here. What is the immersion effect/ immersion effect correction factor? When a quantum sensor that was calibrated in air, such as Apogee's, is used to make underwater measurements, the sensor reads low. This phenomenon is called the immersion effect and happens because the refractive index of water (1.33) is greater than air (1.00). The higher refractive index of water causes more light to be backscattered (or reflected) out of the sensor in water than in air (Smith, 1696; Tyler and Smith, 1970). As more light is reflected, less light is transmitted through the diffuser to the detector, which causes the sensor to read low. Without correcting for this effect, underwater measurements are only relative, which makes it difficult to compare light in different environments. The Apogee full-spectrum quantum sensor (model SQ-500) is more spectrally accurate than the original quantum sensor (model SQ-120), but the unique optics (mainly the shape) cause the immersion effect to be larger for the new sensor. Underwater PAR measurements collected using a full-spectrum sensor can be corrected by multiplying the measurement by 1.32; measurements collected using an original Apogee sensor should by multiplied by 1.08. For details on how these multipliers were determined, read the white paper on Apogee's Immersion Effect Correction Factors for Quantum Sensors. What is the difference between the MQ-200 and MQ-210 / MQ-500 and MQ-510? The only difference between the MQ-200 and MQ-210 is that the MQ-210 has the immersion effect correction factor already applied to the firmware so there is no need for post-measurement corrections for underwater measurements. Similarly, the only difference between the MQ-500 and MQ-510 is that the MQ-510 has the immersion effect correction factor already applied to the firmware so there is no need for post-measurement corrections for underwater measurements.